I am not here to tell you of what you should buy. I am not here to convince you to buy carbon steel pans because they are the best or even where to find them. No, some websites and blog pots will do that for me without asking twice. I am just here to tell you a few things you didn’t know or probably knew but didn’t pay much attention when it comes to purchasing the best carbon steel pans and as well as maintaining them. I am also here to tell you a story. I need me the best carbon steel pan I can get my hands on right now! Those were my exact words I uttered two years ago after visiting an expo and happened to pass by carbon steel pans display table. If you find yourself the best carbon steel pan, they are bound to be durable and long lasting. They are able to withstand long tedious years of heat, wear and tear and still be able to offer the best service. After two long years of service getting burnt and dropping it, my pan still looks as good as new. I am not encouraging you to mishandle your pan though. ​1. They are versatile when it comes to cookery. From omelets, pancakes to quick warming of leftover food on any cooktop, these carbon steel pans are the best. Their versatility makes them an excellent choice for almost any cooking application.​ ​A high-quality carbon steel pan will get your sorted whenever wherever. ​3. When looking at the benefits of having a carbon steel pan, there's a form-factor consideration. Most carbon steel pans have sloped sides, making them much more preferable to some methods of cooking like sautéing. From a cook's point of view, if you want to launch something skyward, you need to send it off a sloping ramp to gain that momentum, not crash it into your own face. if you are keen enough to get a good carbon steel pan for your kitchen needs, you will have a winner. ​4. There is something that says "classy, pick me" about these pans that literally begs you want to buy them. It is like they sell what they can do from just looking at them. It has the touch of old school with a hint of modernization added to it. ​5. Price wise, carbon steel pans are quite affordable and found almost anywhere in the market. But when it is too cheap, precisely at a throwaway price and labeled as the best carbon steel pan, think twice, the best is not always the best. You may earn yourself an extra thin metal you were not looking for. If you want your pan to serve you longer, there should be proper care when handling it. Also, maintenance should also be done to ensure it remains in shape and serve you well. So, how do you ensure the longevity and maintenance of your carbon steel pan? It’s not just about using it to cook then hanging it to dry, surely it’s not. The pans have needs too should you want it to remain at their best. Occasionally, hand-wash the pan after use. Don’t stress yourself with all the steel wool and abrasives when you can just rinse it under hot water and it’s ready to go; that is if it’s well-seasoned. Mild dish soap and a scouring pad can be used to get rid of any stubborn food particles. ​Avoid the exposure of the pan to the dishwasher or harsh detergents. They are not friendly to the life of the pan as well as appearance. It also affects its non-stickiness. After the pan has been washed and rinsed, it should be dried thoroughly using a soft dishcloth or dish towel. A thin and light coat of oil should be applied all over the surface of the pan before storage. If the seasoning of the pan will be ruined at the end of cleaning it, it is advisable to restore it. This can be done by applying a light coat of oil to the pan then exposing it to medium heat for about ten minutes so as for it to develop a new patina. Seasoning a carbon steel pan involves bonding oil to the pan and then exposing it to heat. This is done to all kitchenware made of iron as well as carbon steel. Seasoning prevents your carbon steel pan from rust and enhances its non-stick aspect. If the pan is not seasoned well, it will be exposed to rust when wet or bare and also be able to have food stick on in especially under high temperatures. Some of the carbon steel pans are bought with grease or beeswax as a preventive measure against rusting. If you have this kind of pan, you will need to follow a few steps during your first seasoning to ensure you get the best results. •Dry the pan with an appropriate soft/dish towel before exposing it to low heat. This is meant to ensure that the pan is completely dry. •Have a third a cup of oil added into the pan with peels of two potatoes and a handful of kosher salt. 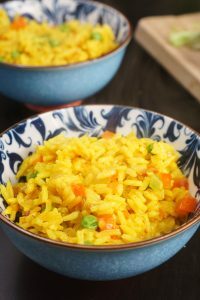 •Cook it for like ten minutes as you stir to remove any hints of grease or wax. •Afterward, cool it then wipe it using a cloth or paper. There are variations of brands that produce varieties of high-quality carbon steel pans which makes it so hard to find the genuine best. Well, some are genuine in their product descriptions while others are just looking for quick marketing strategies. Below are some of the examples I consider as the best when it comes to carbon steel pans. This is a heavy duty carbon that is shiny and mirror-like in appearance and smooth to touch when purchased. It will resemble an ordinary iron sheet at first. It is available in sizes of between 7 7/8 inches to 19 5/8 and in silver, black and grey colors. Well, I prefer grey myself, it just appeals to me. anyway, with proper seasoning, the shine will disappear and obtain a blotchy appearance. Remember patina? Continuous heating of the pan with oil leads to this desirable features as it burns the shiny polymers incorporated in the pan. Warranty for this item can be requested from the customer service. The pan is thick which allows it to be able to withstand longer time of preheating under high temperatures. The material that was used to make it is an excellent conductor of heat which ensures that it takes minimum heat to get hot. The flat, riveted handle makes cooking and handling cooking easy and safe. The pan is perfect for searing. This carbon steel frying pan is 100% natural which makes it very eco-friendly. It is made from pure 99% iron with bee wax finishing. This is meant to prevent oxidation that facilitates rusting. For those people who prefer sealing, browning, and grilling as methods of cooking, this is the pan for you. Like best carbon steel pans, it gets better with age due to the buildup of the nonstick aspect on the surface. It is even better when the pan turns darker. again, the patina thing. The pan has no chemical additives like PTFE OR PFOA making its safety very reliable. The “a la Francaise” handle is curved making it comfortable and easy to work with. The warrant is available at the client’s request from the customer service. ​The pan is made from 99% pure iron which makes it 100% natural and harmless to the environment. Bee Wax is used to protect the pan from rusting through preventing oxidation and enhancing seasoning. It is free from added chemicals like PTFE or PFOA which makes it naturally non-stick especially after seasoning. This product of two handles is made in France. This carbon steel pan is crafted by the renowned French manufacturer Mauviel. It comes in a wide range of sizes. The smallest pan is 12 7/8 inches and the largest 14 inches. There is something reliable about products from well-known brands. The most favorable feature of black carbon steel is great heat conductivity and durability. The material is also able to withstand extremely high temperatures which makes it able to withstand longer time of preheating making it the best choice for searing. The design makes it favorable to be used on any cooktop, this includes gas, electric, induction, as well as the oven. Therefore, the use of induction and metal utensils are safe options. ​This carbon steel pan is made in France. The body is made of extra-thick carbon steel with iron handles. The material makes heat transfer of heat easy which is the best feature when searing. It is characterized by a high performance given the commercial durability nature and the ability to withstand temperatures. This makes perfect when it comes to long hours of exposing it to preheating. The pan is naturally non-stick but it should be seasoned well before the first use as per the instructions of the manufacturer. The Mauviel manufacturers stand behind their products. Therefore your orders are guided from all manufacturing defects obtained from household use. This multipurpose carbon steel pan comes in larger sizes of around 12 inches which makes it perfect for larger families or entertainment. They are bought already seasoned and are big enough to cook a ton of food enough for the sizeable crowd. 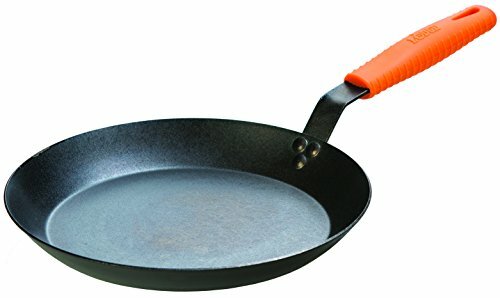 The handle is orange and made of silicon to provide heat insulation of up to 500-degrees F.
The winner about this pan is its safety to expose it to dishwashing. The riveted handle make is designed for heavy-duty purposes. This makes it perfect for commercial and professional kitchenware especially when it comes to sear, sauté, and grill as well as roast and fry. Finally, besides it being favorable for all cooktops, it is very easy to maintain. ​The pan is made from heavy duty 12-gauge carbon steel and crafted with riveted handles. This makes it a perfect addition to your kitchen wares in a professional or commercial setting. The pan is purchased when it is seasoned already for that natural easy-release finish that works better with continued use and time. It is capable of managing a wide variety of cooking methods ranging from the sear, sauté, grill, roast and fry​. The handle is made from silicon which means the heat of up to 500-degree F is insulated. You and your cooking escapades are safe from accidental burns of overheated handles. Also, this carbon steel pan is safe to use in a dishwasher. Without even mentioning the pan and its eye-catching qualities, we are all familiar with De Buyers as the brand that aims for nothing but the quality. This is because their kitchenwares are of the highest quality and crafted with knowledge and skill nurtured over time and passed down the generations. This perfection earns each and every De Buyer product a 2-year manufacturer’s warranty. That is customer satisfaction guarantee. This carbon plus white iron line is a carbon steel pan with exceptional thermal properties as well as a natural surface that is non-stick. If you want to easily grill your steak or those fresh vegetable, this 32cm wide frying pan will do your artistic cooking more fun that you can imagine. It able to withstand very high temperatures as it is thick, heavy, ridged which are features that are able to promote caramelization as well as let moisture and flavor to act as seasoning to the pan. The construction that is made of white iron enhances heat transfer, making it best for searing and browning. It’s long-lasting with high resistance to deformation given the 2.5-3mm robust thickness of the material. The handle is reliable, riveted and unbreakable with a hanging hole to provide comfort and style as well. The versatility of the pan allows it to be used on any cooktops. This carbon steel pan is characterized by perfect heat transfer that makes it ideal for searing, grilling or browning. It has a reliable sturdy and comfortable handle crafted in a strong riveted iron French style. It doesn’t hurt to be a little stylish in your kitchen, does it? 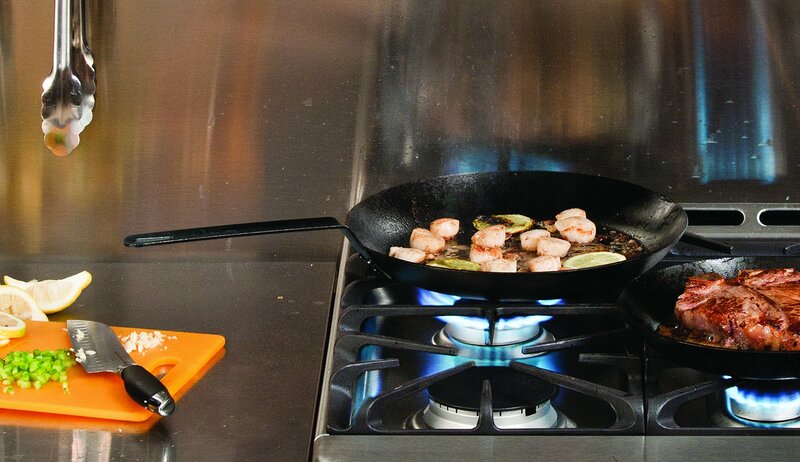 The pan is designed to work perfectly fine on all cooktops. Before you buy a pan, you should consider why you are buying one and what the pan will be used for. Ensure you know if it is for professional or commercial use. Professional carbon steel pans tend to be task specific with characters that make them special to function in a given environment. They tend to be made of strong material, large in size and heavy duty so as to withstand the pressure in a professional for longer. You need to know if the pan you intend to buy is pre-seasoned or not. The pre-seasoned pans tend to have grease or bee wax which means that you will have to pay extra attention and details to the cleaning. For those that are not seasoned, you will need to know what the manufacturer has to say about what should be done before the first use. Some carbon steel pans are cooktop specific despite the fact that most of them aren’t. Before purchasing one, you should look for one that matches the cooktops or surfaces of heating that you own to avoid inconveniences. It is rather advisable to buy one that is versatile, one that goes well with any given cooking surface. Most of the time, we all need a product that is pocket-friendly and affordable. While that remains to be the case, we also need to consider the function of the pan we intend to purchase. The large, heavy-duty, sturdy pans that are used professionally or commercially tend to be more costly as compared to the domestic small best carbon steel pans. Therefore, as much as they should be affordable, the functionality of the pan should be incorporated in its affordability. Also, this largely depends on the function of the pan. For commercial or professional carbon steel pans, go for the light ones that are easy to manage. For the domestic, well, I prefer a light one as well but I don't mind a heavier one. Why? This is because I desire the best results in the kitchen and two, I won’t be in the kitchen for long or use it on a daily basis. Generally, the weight should be manageable for whatever duration you will need to use the pan. Always go for the length of the handle that will comfortable when handling the pan and short enough to avoid accidents in the kitchen. I hope you enjoy this article. Happy cooking!